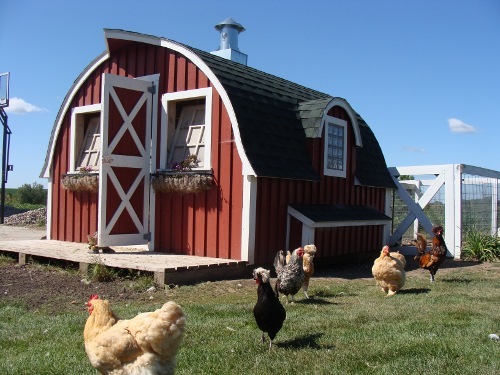 One of the first things you need to consider when constructing your coop is the size — which should be based on the number of chickens you plan to house. The more space you can provide your chickens the better, as chickens that are too confined could begin fighting. A general rule of thumb is to provide four square feet of floor space per full-sized hen. Of course, smaller breeds will require less space. A protected outside run will provide your chickens a safe area to get fresh air and sunshine — which are both vital for their growth and productivity.A small door on your coop allows your chickens to easily go in and out and gives you control of their access. You might want to consider utilizing a Coop Controller to make management of their access more efficient. A sensor automatically opens the access door at sunrise, and closes it at sunset. It also keeps the door closed if the temperature is below 20°F so your chickens are kept warm and safe during extreme winter temperatures.The bottom of your run’s fencing should be secured deep enough in the ground to prevent unwanted animals from digging under the fencing and gaining access, as well as to prevent opportunities for your chickens to get out. In addition, the fencing you select should be strong enough to withstand predators from tearing through it. Because chickens are “wired” to sleep high above the ground, they will search out the highest place in the coop to perch before going to sleep for the night. Installing a perch will give them a place to comfortably roost. A tree branch that is approximately three inches thick makes an inexpensive and effective perch. Our day roost easily installs to any 4″ x 4″ post. Even though hens like to snuggle up when they sleep, you will want to make sure the perch is big enough to give them ample room to move around — a good rule of thumb is one square foot per chicken. Be sure to keep the space under the perch clear, as it will end up covered with droppings and allow for easier cleaning of the space. A nesting box is a great solution for providing chickens with a private place to lay their eggs. Even though they will build a nest and lay them just about anywhere, having nesting boxes makes it convenient and comfortable for both of you. You can build your own nesting box or purchase them pre-made, such as the Single-Hole Roll Out Nest or the Rugg’ Ranch Egg Nesting Box that we offer on our website. One nesting box can be used for no more than four to five hens. The boxes should be big enough that the hen can comfortably get in and out and turn around, but small enough that they feel safe. A standard rule of thumb for size is 12” x 12” x 12” but this can vary depending on the style of nesting box. Adding an outside ledge provides hens a place to fly to, and get situated before entering the nesting box. Boxes should be kept dry and clean and include some type of bedding to cushion the eggs as they drop. This is a great opportunity to use compostable materials so you can easily toss all the bedding into your compost bin, if you have one. Experiment with the placement of your nesting boxes to find a location that works best for you and your hens. Be sure to keep the nesting boxes off the ground so that the eggs are out of the sightline of the hens. Proper lighting is important for a hen’s health and their ability to lay eggs. Egg production slows down when hens don’t have enough sunlight. Select bulbs that cast a warm glow and avoid bluish-white light as it will not trigger laying. Your coop should also include a window to allow for natural light. Hens need about 14-16 hours of light to continue to produce eggs in the winter. Proper ventilation is vital as it removes humidity, dampness and odors that can cause your chickens to get sick. Chickens rid the water they drink in the form of vapors which makes the air inside a coop more humid and ultimately unhealthy for breathing. You can add a screened-in area between the walls and the roof to allow hot air to escape without causing a draft in the sleeping area. Another option is having windows or flaps built in to the coop to provide good air flow. Just be sure that any openings are well reinforced so predators cannot get inside. Regardless of where you live, you will have predators. Using wood floors will help ensure that predators don’t have easy access to your flock. Dirt floors make it easier for them to dig holes and gain access to your chickens. Cover holes with wood or hardware cloth as open areas can be quickly found by predators and cause multiple issues. For instance, snakes can slither in and not only eat small birds but your eggs as well. Use solid materials to build walls to keep predators out. Your roof should be solid and leak-free. A solid roof keeps not only the predators out, but the elements as well. Be sure your coop has a door to provide you with easy access to cleaning of the coop and to allow for proper ventilation while doing so. Whether you decide to build your own chicken coop, or buy a pre-made one, the cost will vary depending on how elaborate you want it to be. Coops can range from a few hundred dollars to thousands. We’ve seen a lot of very creative coops over the years and believe that your coop should be a reflection of your personality and surroundings. Have fun with the construction process — it is part of the fun of owning chickens. For more information and materials to consider using in your coop, we invite you to check out our website. We have also compiled a list of some of our more popular items and resources in our latest newsletter for your quick reference.